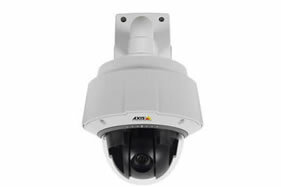 The low priced AXIS P5415-E PTZ Dome Network Camera is the latest PTZ Dome camera from Axis for outdoor areas. The camera with HDTV 1080p-resolution and 18x zoom has a pan-and-zoom system with direct drive, which ensures the mechanical resistance. The application areas range from public places, car parks to school playgrounds. With the Advanced Gatekeeper function, it’s possible to detect motion in the monitored area, to pan automatically to a predefined position or to tilt and zoom to a predefined area. Another plus: The IP camera comes with an integrated wall mount, which allows an optical integration of the camera into the building. The camera or the included sun protection can also be painted in the same color of the building and thus fits better into the general view. The sunshade is easily removable; the tapered shape makes it difficult to tearing down the camera. 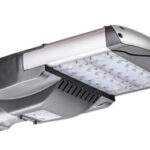 With a pivot angle of 270 °, the AXIS P5415-E can also be mounted at building corners by using the corner bracket. The AXIS P5415-E is a very reliable and low maintenance PTZ camera and has a very robust and efficient pan and tilt system. The camera is connected directly with two motors via a drive shaft, one to panning and the other for tilting. With the much more light-sensitive image sensor it’s possible to record pictures in a high quality. You are interested in the AXIS P5415-E or have any questions about this camera?